Airturn recently sent me their new foot pedal board. Basically what they've done is to mount two foot switches and their Bluetooth transmitter to a plexiglass board so that the switches don't slide around on the floor as you use them. This was my biggest gripe with the Airturn foot pedals before.....you constantly had to adjust their positions, which was a major drag. The second generation Airturn pedals seem to be made a little better than the first ones were. I like the positive response of the Airturn pedals and compared to the Cidada pedals, which I recently reviewed here, there is little chance that your foot will accidentally trigger the switches. I voiced my concerns about the mushy feel of the Cicada to the designer and his response was that they were also designing the pedals for the handicapped and they wanted to make the pedals very easy to depress because of this. The Airturn switches do not have much travel (unlike the Cicada pedals) and you really need to consciously push your foot down to trigger them, which I find helpful and I was having problems with unintended page turns when using the Cicada pedals. If you haven't received our new ATFS-2 pedal board, you should be getting it very soon. We hope you enjoy trying it out! The ATFS-2 is designed to be absolutely quiet in operation, aiming to be the most silent consumer foot switch on the market. This is thanks to the fact that aside from the hinge, there are no moving mechanical parts - no squeaky hinges, no clicking switches, thanks to our unique switch design that uses a rare earth neodymium magnet and a rhodium reed switch, both of which are embedded in the body of the plastic. I'm sure you'll appreciate this when you have to use it in professional recording situations that require the elimination of all external noises. The BT-105 is also capable of multiple keyboard profiles. That means that you can change the keyboard output for different programs and applications. In iPad mode, the BT-105 sends up and down arrow keys. In PC mode, the BT-105 will send Page Up and Page Down keys. Two other modes will send specific number keys and another set of keys specifically for applications in the disabilities market. We've tried to make the BT-105 a universal device with applications far beyond page turning - we've already partnered with developers making apps for Teleprompting and audio track triggering, even one for looping (coming soon!) If you'd like to try out some of the other profiles, you'll find the instructions in the manual that should be included with your BT-105. Another subtle feature of the BT-105 is the way that it pairs automatically and displays its unique serial ID. Most other external Bluetooth page turning devices require the manual entry of a passkey code. Thanks to the BT-105's use of Bluetooth protocol 2.1 + EDR (the latest version of Bluetooth), it's able to pair automatically with the iPad without the need for passkey entry. It also allows for the unique serial number to be displayed in the iPad's Bluetooth device settings. If you ever have to work with multiple musicians all using iPads and their own BT-105s, you'll quickly see why this is so important - you can quickly and easily identify which BT-105 belongs to which iPad, since each device's unique serial number will show its connection status to any given iPad. Lastly, we hope you enjoy our new pedal board design. While the BT-105 was designed to be a modular system, with the ability to use one or both pedals for page turns (I typically only use one pedal in performance, since I design my music to only require forwards page turns - this is to prevent accidentally turning backwards), we've been finding that most customers prefer using both pedals all the time. The pedal board keeps all your equipment together in a sturdy base, with extra bumpers on the bottom for a non-slip grip on the floor. I've taken the new Airturn pedal board out for a spin on a few gigs was quite happy with how it performed. I didn't have any issues with accidental page turns, the pedals felt like they were in optimal positions and my foot was able to stay in a comfortable position. The pedals makes no noise whatsoever when you use them and they look unobtrusive on stage. I actually gave my Cicada foot pedal unit to my buddy because I was sure that I'd never go back to using it as long as I had the Airturn unit. 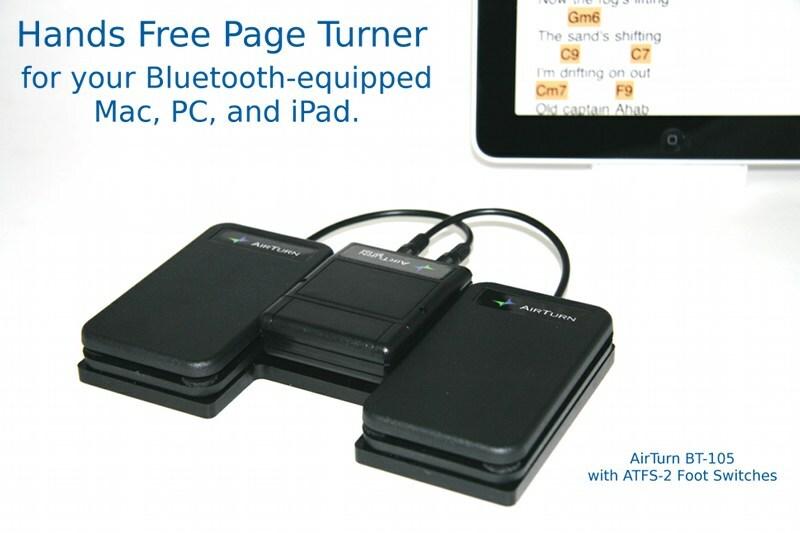 The Airturn pedal board unit retails for $129.